Of the 200 countries where Coca-Cola is sold, India reportedly has the fastest-growing market, but the adverse environmental impacts of its operations there have subjected the parent company and its local bottlers to a firestorm of criticism and protest. There has been a growing outcry against Coca-Cola’s production practices in India, which are draining out vast amounts of public groundwater and turning farming communities into virtual deserts. Suicide rates among Indian farmers whose livelihoods are being destroyed are growing at an alarming rate. Every day for years there has been some form of protest, from large demonstrations to small vigils, against Coca-Cola’s abuses in India. “The Indian Parliament has banned the sale of Coke and Pepsi products in its cafeteria,” Srivastava added. “The parliamentarians should take the next logical step, and ban the sale of Coke and Pepsi products in the entire country.” He said the ban came as a result of tests by the Indian government and private laboratories which found high concentrations of pesticides and insecticides in the colas, making them unfit for consumption. “Some samples tested showed the presence of these toxins to be more than 30 times the standard allowed by the European Union. Tests of samples taken from the U.S. of the same drinks were found to be safe,” he said. 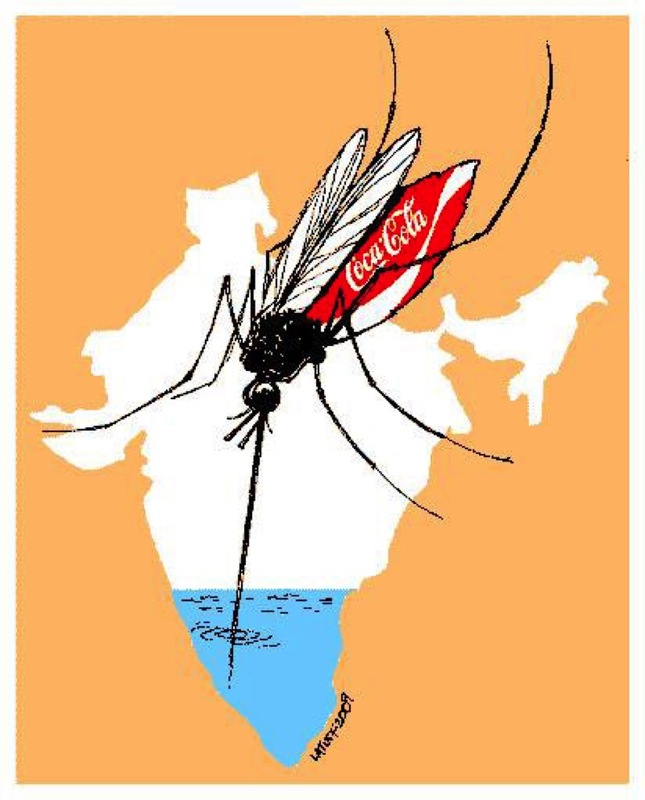 “It is only a matter of time before the Coca-Cola company will be held financially and criminally liable for their operations in water-stressed areas in India,” Coca-Cola shareholders were told at the April 2010 shareholders meeting in Duluth, Georgia. “The company management is being seriously derelict in its duties by not acknowledging the real extent of the liabilities Coca-Cola has incurred and continues to incur in India,’ said Amit Srivastava. 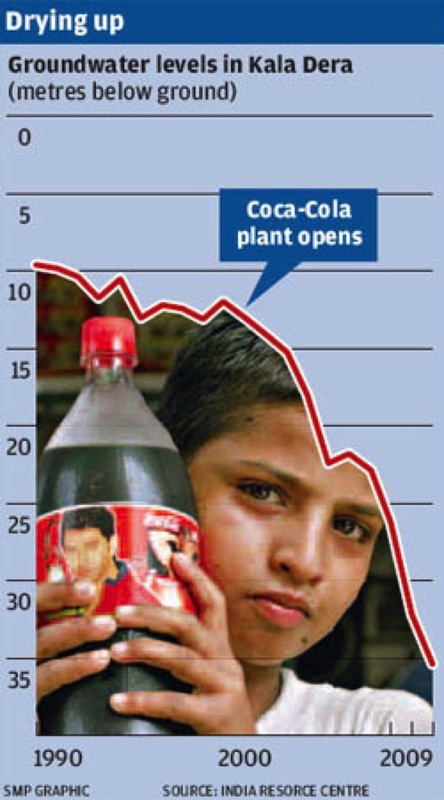 One of Coke’s plants in India has been shut down since March 2004. The company’s overexploitation and pollution of scarce water resources continue to spark large protests. Oddly enough, Coke at the time, didn’t mention the fact that Sanjiv Gupta, president and CEO of Coca-Cola India, sits on the executive council of the Institute and that Coca-Cola contributes heavily to the World Environment Foundation. Coke also boasted: “In late 2005, the Confederation of Indian Industry (CII) recognized the Hindustan Coca-Cola Kaladera plant as a ‘Water Efficient Unit’ across industries at the National Awards for Excellence in Water Management.” But Coke didn’t disclose that Tarun Das, director-general of the Confederation of Indian Industry, serves on the International Advisory Council of The Coca-Cola Company. It’s simply amazing that any campus administrator, let alone the University of Michigan’s CFO, could be duped into believing that TERI would be impartial or independent. After all, Coca-Cola India Ltd. was listed by TERI on its website as a corporate sponsor and TERI Governing Council member Deepak S. Parekh was on the Advisory Board of Coca-Cola India. At the time, at least two current projects of TERI were being sponsored by Coca-Cola India Ltd.
“This is a grave public health scandal,” said Sunita Narain, CSE’s director and winner of the prestigious 2005 Stockholm Water Prize. But on August 14, 2006, BBC News had pointed out a significant flaw in CSL’s tests. It reported that “the tests were done by the UK-based Centre Science Laboratory (CSL), which is known for its expertise in testing for pesticide residue in food. The Centre for Science and Environment (CSE), which claims to have discovered the pesticide contamination in the first place, says the [CSL] scientists only tested Coca-Cola samples provided by the company itself. To a corporate giant like The Coca-Cola Company, $2 million is insignificant pocket change – literally a drop in the ocean of money it extracts from the worldwide markets where its overpriced, often unhealthy beverages are sold. So, did Coca-Cola get its money’s worth when it paid a New Dehli-based think tank $2 million for a “third-party assessment” of the environmental havoc it has wreaked in India? However, the report said a watershed at Kaladera, Rajasthan, where one plant is located, has been so “overexploited” that Coke should consider relocating the plant or shutting it down. Misleading headlines (like “Coke Makes Cleanup Gains” in The Wall Street Journal) helped Coke apply its PR spin to the TERI story, but no amount of glib interpretation can hide the fact that Coke continues to cause devastating local water shortages. It even points out that the company hampered TERI’s assessment by refusing to share the environmental impact assessments for any one of the six plants. Perhaps most noteworthy of all, it validates the main concerns of protestors about water scarcity and pollution. “In general, the community perceptions were found in conformity to the results obtained from the detailed technical assessment of groundwater resources,” the report said. The University of Michigan and Coca-Cola agreed to commission the TERI report after students argued that Coke’s water-management practices violated the university’s code of conduct for vendors. UM was among the largest of more than 46 colleges and universities that removed Coke products from campuses because of flagrant corporate irresponsibility overseas, particularly in India and Colombia. “New Delhi: The state government of Kerala in India has approved a draft Bill to set up a tribunal which will allow individuals adversely affected by Coca-Cola’s bottling operations in Plachimada to seek compensation from the company. The state government is expected to introduce the Bill in the state legislature next week, and the Bill is expected to pass. “In a statement here, council convenor R Ajayan said TERI’s 500-page report had not made any suggestion of a clean chit, though the report was an attempt to hide certain facts and `whitewash’ the company’s operations. “The Plachimada Coke plant, which could not operate for the last four years following locals’ agitation was left out from the purview of the study. The report was silent on why the plant at Plachimada and the one at Ballia in Uttar Pradesh had to suspend their operations. 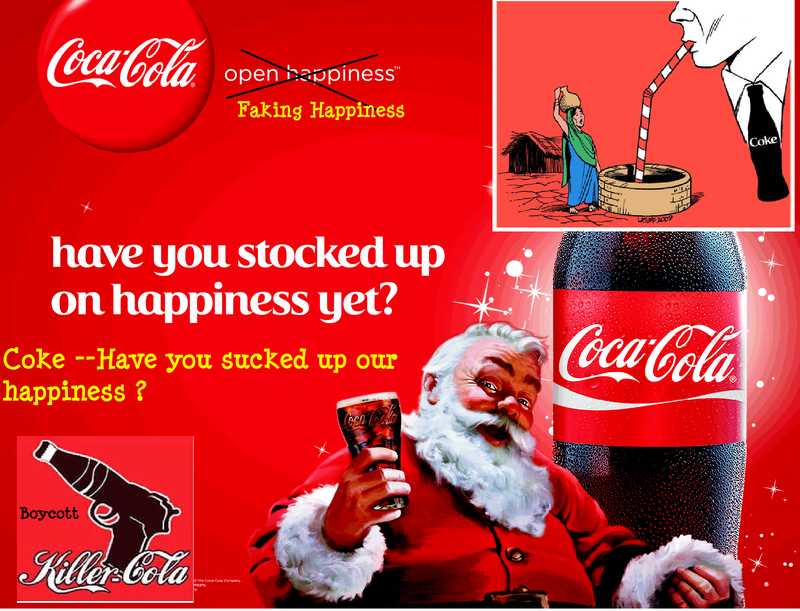 According to media reports and a press release from the India Resource Center, “In a major step towards holding Coca-Cola accountable for damages it has caused in India, the state government of Kerala decided on Wednesday to move forward with the formation of a tribunal that will hear and award compensation claims against The Coca-Cola Company. “The Kerala state cabinet’s decision is based on the report and recommendations of a High Power Committee which released a report on March 22, 2010 holding Coca-Cola responsible for causing pollution and water depletion in Plachimada in the state of Kerala in south India. “Using the ‘polluter pays principle’, the High Power Committee had recommended that Coca-Cola be held liable for Indian Rupees 216 crore (US$ 48 million) for damages caused as a result of the company’s bottling operations in Plachimada. “The Coca-Cola bottling plant in Plachimada has remained shut down since March 2004 as a result of the community-led campaign in Plachimada challenging Coca-Cola’s abuse of water resources. A team from the Orissa government’s labour ministry was also investigating the accident. “We are awaiting the report of the boiler inspector,” Patra said. 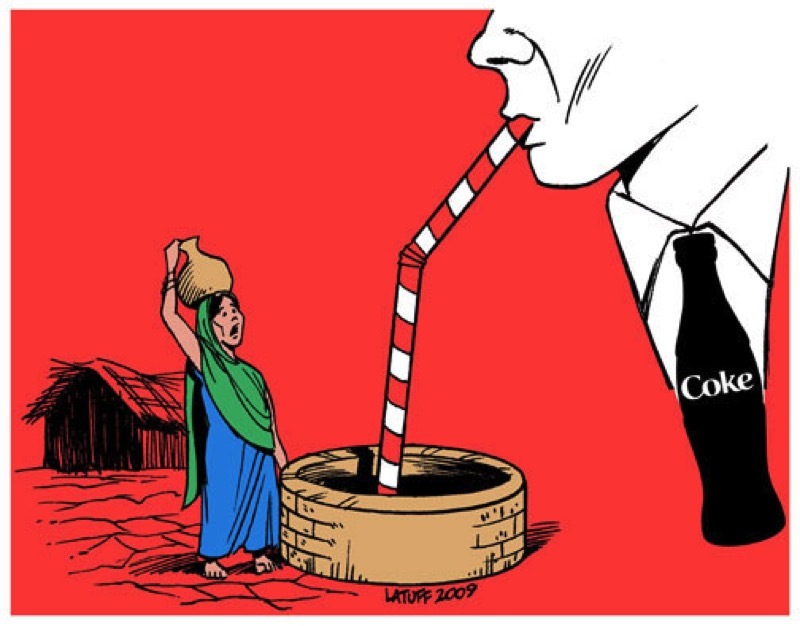 For information on Coca-Cola’s crimes in India, go to the site of the India Resource Center at www.indiaresource.org.